Adder Fiber Optic KVM Extenders enable a Dual-Head DVI Extender or Dual-Link DVI Extender over Single Mode or Multi Mode fiber optic cable plus USB, Audio and RS232. This makes products suitable for stand-alone DVI fiber optic Extenders or Digital DVI Video and USB fiber optic KVM Extenders. Network DVI Extender – Pure digital media extension over IP featuring dual head & dual link video. Featuring Full DVI, Digital Audio, USB True Emulation, Network Multicast, Device Switching and EPG style user interface. Full dual link DVI resolution. ADDERLink INFINITY FX is a dual head (2 x 1920×1200), dual link (1 x 2560×1600) DVI KVM extender over fiber. Delivering DVI and bi-directional USB, Audio and RS232 across distances up to 10KM with no lossy compression and minimal lag. 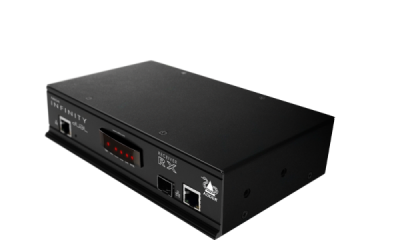 As part of the ADDERLink INIFINITY range, this KVM extender can easily be integrated into a wider matrix at any point, or kept as a robust point to point extender. The ADDERLink INFINITY FX comes with a choice of single mode or multimode fiber modules to suit your specific application.